At this time of year, grocery shelves are bursting with everyday foods that have been combined with pumpkin. They mark the arrival of autumn, and the list seems to grow larger every year—pumpkin bread, pumpkin pie, pumpkin cereals, pumpkin spice lattes, and pumpkin ravioli, just to name a few! Did you know that in addition to tasting great, pumpkin has many surprising health benefits as well? 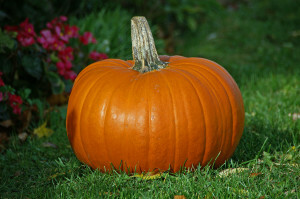 Pumpkin is loaded with vitamin A, which helps keep your vision sharp. It also has lutein and zeaxanthin, two antioxidants that can prevent cataracts and slow macular degeneration. Pumpkin contains fiber, which can aid in weight loss as it helps you to eat less and makes you feel satisfied longer after eating it. Pumpkin seeds are rich in phytosterols, which have been shown in studies to reduce LDL, also known as the “bad cholesterol,” which can lead to plaques in the arteries. Pumpkin’s vitamin A content also helps strengthen the immune system, which helps fight off viruses and bacteria. With its ample supply of vitamin C, pumpkin can help decrease the time it takes to recover from colds. The tryptophan in pumpkin is an important precursor of serotonin, the “feel-good” chemical that can lift your mood. The beta-carotene in pumpkin may help ward off certain cancers. This same beta-carotene also helps revitalize the skin and protects it against free-radical damage that can cause wrinkles. A cup of pumpkin has more potassium than a banana, which can keep your muscles to function at their best. Additionally, this potassium may help prevent hypertension (high blood pressure).